Whoooo Wants to Prowl for Owls? Bundle up on a crisp, quiet November evening to search for owls or head out for a birding caravan - South County style. Learn how to paint birds with local watercolor artist Holly Wach or meet local bird carvers and marvel at their amazing work. Nature awaits in November, get out and join the fun with Audubon! Unless noted, registration is required for all programs. Register online through the events calendar. You may also click on each program title to register or learn more. Award-winning wildlife artisans from throughout New England are returning to Audubon this autumn. Unique hand-carved bird and wildlife pieces will be on display and for sale. Meet the artists, shop the carvings, observe demonstrations and enjoy the beauty of the Audubon Nature Center and Aquarium in fall. This is one of New England’s finest bird carving events. Audubon Nature Center and Aquarium, 1401 Hope Street, Bristol, RI; Admission Fee: $5. No need to register. Ages: Adult. Drop by the barn at Caratunk for come cocoa or coffee, cookies and casual fun. Visitors will meet an animal, create a craft, sip some cocoa and take an easy hike. Cocoa and crafts will be available from 1:00 - 3:00 pm, with an animal interview at 2:00 pm. Dress for the weather. Caratunk Wildlife Refuge, 301 Brown Avenue, Seekonk, MA; Fee: $8/member adult & child; $10/non-member adult & child; All additional children $4; Ages: All. Register through the events calendar. Meet an Audubon owl in the barn and then head out on the trails to search for these amazing creatures in their natural setting. Please dress for the weather, wear sturdy walking shoes and bring a flashlight. Caratunk Wildlife Refuge, 301 Brown Avenue, Seekonk, MA; Program Fee: $10 member adult/ $5 member child; $14/non-member adult, $7/non-member child. Ages: 10+. Register through the events calendar. Visit Fort Refuge on an autumn night to search for owls. An Audubon naturalist will call for different species as we walk through the forest. 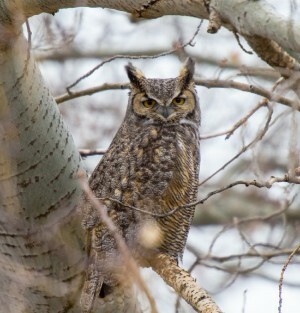 We never know if we'll hear or see an owl, but participants will learn a lot and have a great night hike. Please dress for the weather, wear sturdy walking shoes and bring a flashlight. Fort Nature Refuge, (Rt. 5), 1443 Providence Pike, North Smithfield, RI; Fee: $10/member; $14/non-member. Ages: 14+. Register through the events calendar. Watercolorist Holly Wach will share with art lovers of all skill levels some of her best watercolor techniques. If you've ever wanted to be able to control color with water, this friendly, relaxing class will help tremendously. You will learn techniques and approaches that will awaken your creativity and have you making watercolors that capture the beautiful colors and images of birds. For the novice to the advanced artist, ages 16+. Audubon Nature Center and Aquarium, 1401 Hope Street, Bristol, RI; Fee: $40/member; $48/non-member. Ages: 16+. Register through the events calendar. Plastic birdseed bags are not recyclable. Instead of sending them to the landfill, repurpose them into fashionable tote bags or aprons! Create a unique holiday gift for someone special or for yourself. Bonnie Combs from Bird Brain Designs will show you how in a Do-It-Yourself workshop. If you have a bird special seed bag at home that you’d like to use, please bring it with you too. (Note: aprons require large bags). Audubon Nature Center and Aquarium, 1401 Hope Street, Bristol, RI; Fee: $5/member, $7/non-member. Ages: Adult. Register through the events calendar. Thanks to Citizens Bank, the Audubon Nature Center and Aquarium is open free to the public the first Saturday of every month*. Join Audubon for crafts, animal discoveries, hikes and more. 9:30 am-4:30 pm: Leaf Hunt: Find all 10 leaves hidden in our Exhibit hall and win a prize. 11:30 am: Celebrate Fall: Venture outdoors in search of signs of fall! Collect fallen seeds, colorful leaves, bark, sticks and more. Take your treasures back to the Center and turn them into works of art to take home. * Citizens Bank Free Family Fun Day will be held the second Saturday in November due to the Bird Carving and Wildlife Exposition held on November 3, 2018. The Wild World of Whales! Come to Audubon and learn all about the amazing world of whales. No registration is required. 10:00 am - 4:30 pm: Whale Tail Scavenger Hunt. Find all 10 whale tail pictures in our exhibit hall and win a prize. 11:00 am: Wild for Whales! Discover the world of whales and their importance in our ecosystem through fun, hands-on activities. Kids will also learn about the plight of the endangered North Atlantic Right Whale. Audubon Nature Center and Aquarium, 1401 Hope Street, Bristol, RI; Program is free with admission, no need to register. Ages: All. Come create a beautiful pendant with sea glass found on local beaches. Learn how to choose the right piece of glass and transform it into creative jewelry using quick and easy wire wrapping techniques. Program includes all materials. Find something special on the beach? Bring that too! Advance registration is required. Audubon Nature Center and Aquarium, 1401 Hope Street, Bristol, RI; Fee: $30/member; $35/non-member. Ages: Adult. Register online through the events calendar. Join Audubon at Moonstone Beach to search for ducks! Walk along the beach to look for species swimming in Trustom Pond and on the ocean. Bufflehead, Scaup, Eider, Scoter and other waterfowl will be spotted. Just bring your binoculars and Audubon will provide the donuts! Meet at the end of Moonstone Beach Road. Moonstone Beach Road, South Kingstown, RI; Fee: $10/member; $14/non-member. Ages: 12+. Register through the events calendar. Fairies aren’t just for kids! Come get creative and make an enchanting scene using natural materials, while enjoying a glass of wine and having fun! Fairy houses make beautiful and interesting centerpieces or decorations for the winter season. All materials are provided, but if you have something special you would like to use, please bring it along. For ages 21+. Audubon Nature Center and Aquarium, 1401 Hope Street, Bristol, RI; Fee: $25/member; $30/non-member. Ages: Adult. Register through the events calendar. Artist Brenda Wrigley Scott grew up in Bucks County, PA and painted with local artists from an early age. She has degrees in art, has been working at Wrigley Ceramic Designs and concentrating on large-scale bird paintings for several years at her studio in Tiverton 4 Corners. Her exhibit will feature paintings of New England birds in acrylic. Meet the artist at the exhibit opening on November 18, 2018 from 1:00 to 3:00 pm. Give thanks for all that nature has given us. The day after Thanksgiving is for leftovers, but at Audubon it is also a day to rediscover why nature matters though fun, birdy activities for the whole family. No registration is needed. 2:00 pm: Turkey Trot Nature Walk: Walk off your turkey dinner (weather permitting). Audubon Nature Center and Aquarium, 1401 Hope Street, Bristol, RI; Free with Admission, no need to register. Ages: All. Audubon is bringing back their traditional Thanksgiving weekend celebration of Mother Nature! Starting in Galilee, naturalist Bob Kenney will lead a caravan to the hotspots along the South County shore. Dress for the weather and bring binoculars. Departs from Salty Brine State Beach parking lot. Departs from Salty Brine State Beach, 254 Great Island Road, Narragansett, RI; Fee: $10/member, $14/non-member. Ages: Teen to Adult. Register through the events calendar. Build your very own birdhouse for your backyard feathered friends. A birdhouse also makes a wonderful holiday gift. Learn how birds build their nests and how bird boxes help our environment. There will also be a visit from our resident owl. Adult supervision is required for children participating in this program. For ages 7 . Please indicate how many birdhouses you would like to make at time of registration, all materials and tools will be provided. This is a Feathered Friends Kid's Club Program. Audubon Nature Center and Aquarium, 1401 Hope Street, Bristol, RI; November 24, 2018; 10:00 am-12:00 pm; Fee: $15/member fee per birdhouse, $20/non-member fee per birdhouse. Ages: 7 and up. Register through the events calendar. Enjoy a cup of cider and a pastry then head outside to burn some calories while learning about winter in the wildlife refuge. This guided hike will last approximately one hour on easy to moderate trails. Be sure to dress for the weather and meet in the barn for cider. The hike will begin at 1:30 pm. Audubon Nature Center & Aquarium, 1401 Hope Street, Bristol, RI; Fee: $10/member child, $6/member siblings; $12/non-member child, $8/non-member siblings. Ages: 6-12. Register online through the events calendar. Meet in the nature center for a presentation on amazing owl adaptations, and enjoy a visit from one of Audubon’s owls. Then walk the trails in search of these intriguing birds in their natural setting. Please dress for the weather, wear sturdy walking shoes and bring a flashlight. Fisherville Brook Wildlife Refuge, 99 Pardon Joslin Road, Exeter, RI; Fee: $10/member adult, $5/member child; $14/non-member adult, $7/non-member child. Ages: 7+. Register through the events calendar.